Back blogging after around a year break with a case study about how we did the visuals at CLANkidz this year. The break was partly because of getting married and having little time do any VJing and certainly very little innovation. However CLANkidz is a regular commitment and some changes we made this year worked so well that it is worth recording. CLANkidz is part of CLAN Gathering, New Wine Scotland’s one week conference in St Andrews. The Venue: over the past six years we have had CLANkidz in marques, and college assembly halls. Each time our space requirement is for a main venue for when all the age groups are together and break out areas for each age group. 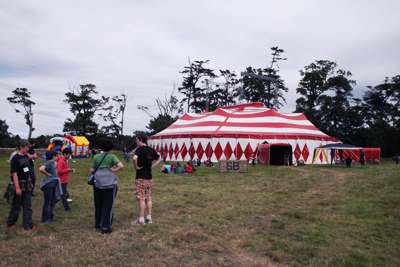 The solution this year worked very well by using a ‘big top’ with age group divisions inside the main space. Technical Setup (non-visuals): I am only interested here in visuals, so I don’t have much details of lighting or sound. 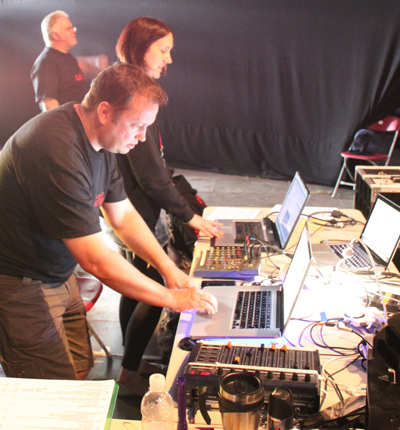 All PA and front of house video was supplied by SFL and Steve from SFL mixed the sound desk for us all week. We gave him a single stereo feed from ‘video land’ which was more or less always live. I’m not sure who the lighting suppliers were, but as lighting is visual we took control of that rather than leaving it on pre-sets. One more little word about the team on site from SFL – the production values, attention to detail and flexibility was great and they really did give us a fantastic service and were good to work with. build atmosphere: we want the children to enter into and enjoy a vibrant exciting venue, unlike any church they have ever been to. Especially as they arrive we are playing current music videos, games, as the week goes on we build in some ‘in-jokes’ using photos or video from the week so far to build it into their space. calm atmosphere: similarly we can play calming music and video if needed to calm the kids down or simply turn off the visual stimuli when we want them to focus on someone or something going on in the program. show video clips: for teaching or point making, we use pre-prepared clips from online sources or movies if requested by the speaker. show song words: another obvious need for video is to display the song words during worship, but we also try to mix visuals with the song words not just display words. visual worship: by this I mean the spontaneous mixing of visuals to match the atmosphere of worship or teaching that is going on. video stings and titles: several sections of the program that we had prepared title videos to introduce presenters, make a point or simply to give shape to the program, thus making a difference between what just happened in front of the children and what was on the screens. background: if nothing else was demanded we put animated logos, computer generated graphics or time lapse videos on the screens as a simple backdrop and played background music as and when required. How we made it happen: The front of house set up was two 10′ x 8′ screens (I think) suspended from a truss at the back of the stage with a projector for each screen, and three pairs of 26″ flat screen monitors along the front of the stage. The monitors are needed because the P1 and P2 kids are so small and can’t see the big screens so rely on these monitors to be able to see what is going on. The left hand screen and the left of each pair of monitors get the same signal and the right had screen and right hand monitor get the other feed so that each pair is make up a single widescreen image. 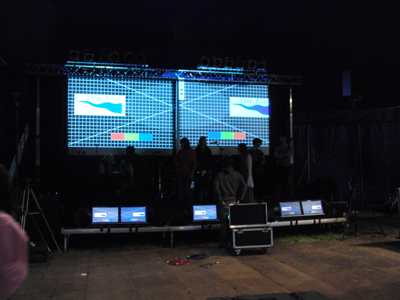 This photo taken during the setup shows our test image spread across the two screens and front monitors. Windows laptop running Easy Worship to generate song words and any powerpoint presentations required. So the signal path for this is fairly self explanatory in that the mac running GrandVJ generates the signal appearing on the screens and everything else either controls GrandVJ or creates an input to it. GrandVJ itself can play either of the inputs (live camera or Easy Worship) or any video on its own hard drive as well as various text and visual generators within the software. In addition to the many bespoke videos created for this event we have a library of several hundred videos that can be used as backgrounds or to make specific points. The ‘artistic’ bit is knowing what we have available and when to play it during worship, meditation, silly games or warmup sessions when nothing specific is called for in the running order. Mac Book Pro, running Arkaos GrandVJ : £244 for the software, the mac needs to be top spec in order to run this graphics hungry software and the one we use is a two year old top of the range costing £2000 at time of purchase. The problem with counting up prices like this is that it is only the hardware that it is easy to put value on, there is no way of adding up the amount of video and audio material purchased, created or stumbled upon over the years, or the cost of depreciation of the machines running all this or man hours involved in putting it all together. This entry was posted in case study, children's work, Christian Worship, GrandVJ, hints and tips, how-to, performance visualist, Uncategorized, Visuals in Worship. Bookmark the permalink. Fantastic helpful post. What resolution are you outputting to your projectors? Do you notice any lag using the vga2usb going into GrandVj?